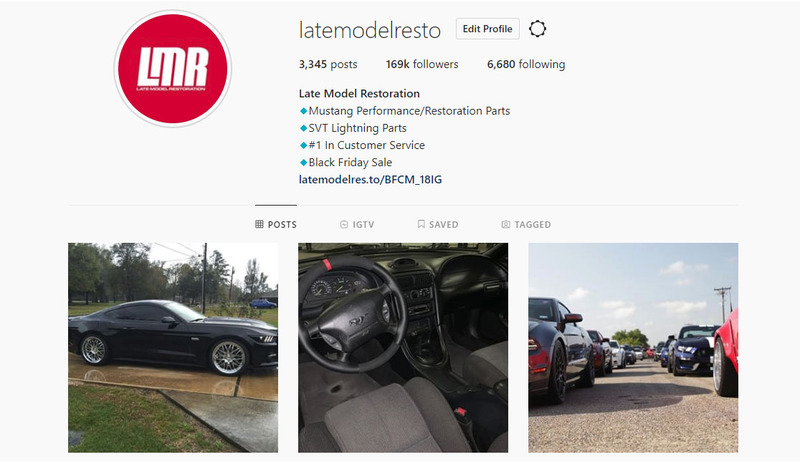 There are many different Mustang Instagram pages to follow and LMR breaks down the top 7 pages to follow for the latest and greatest content. With social media ushering in a new wave of Mustang owners, it’s no surprise that Mustang instagram pages are starting to become the most popular way for people to see new builds. 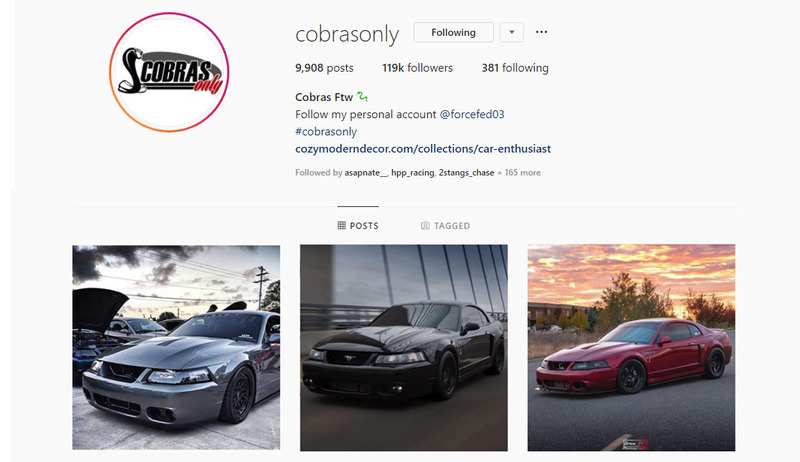 With some pages in the hundreds of thousands of followers range, they are gaining a massive following from Mustang owners and even Mustang parts companies. Back in the 80s and 90s, having your Mustang featured in a Ford Mustang magazine was just about the coolest thing that could happen, except maybe having it in a SEMA booth, but those were harder to come by. Now, having your car featured on one of these pages seems to be even more popular than a magazine feature. While this may seem like a crazy thought, especially for those new to social media, but this is a great way for people to get instant feedback from their peers and gain a following for their builds. As someone who has been in the social media car scene since Instagram was debuted, I have watched hundreds of people go from a few followers to over 100,000 followers over the years. This has helped create influencers who many new Mustang owners turn to for advice and part suggestions. Not only that, but it has created many lifelong friendships within the community. 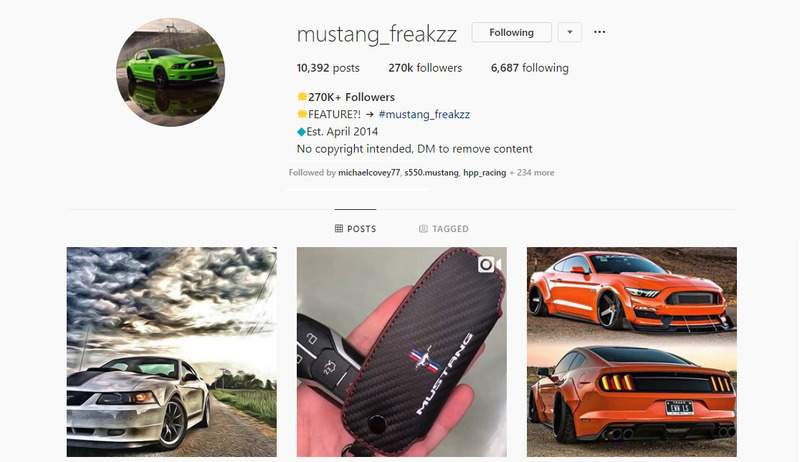 Let’s take a look at the top 7 Mustang Instagram pages you should follow and what they are all about. Shameless plug, we know, but if you are wanting to find out all of the latest sale releases, exclusive behind the scenes, and daily customer car features, we have it all. With over 169,000 followers, our community of real Mustang enthusiasts is growing everyday and we want you to be apart of it! 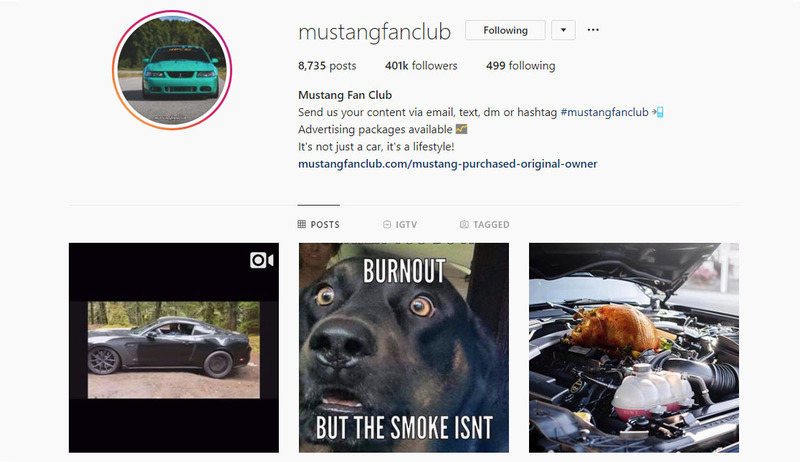 Being one of the earliest Ford Mustang instagram pages to hit the scene, MustangFanClub has exploded over the past 5-6 years providing Mustang fans with the latest Mustang news, owner features, and the occasional Mustang meme. MFC has also hosted the annual MustangFanClub Meet & Greet over the years at Mustang Week. 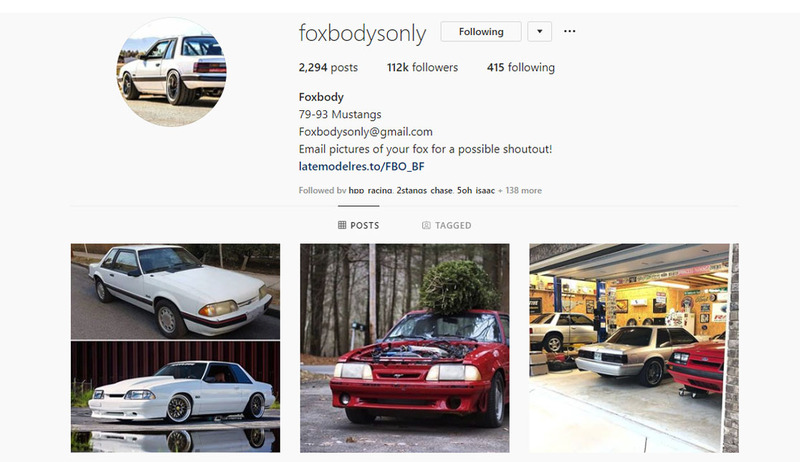 If you are a Fox Body owner or just a fan of the iconic body style, FoxBodysOnly is the Instagram to follow. Built by real Fox enthusiasts, this Instagram brings you the latest and greatest Fox Body news, content, and builds from all over the world. I have seen so many interesting and over the top builds that I would have never seen had I not followed. One of the most popular Mustangs to ever hit the production floor was the SVT Cobra. They have developed such a following that there are Cobra Instagram pages dedicated to nothing but Cobras of all generations. CobrasOnly is one of these pages and provides you with the hottest Cobra content multiple times daily. As a Cobra fan myself, this was one of the first pages I followed when I joined Instagram and have yet to be disappointed. For those looking to see the latest news, photos, and builds on the 2015+ platform, you are going to want to give S550SOnly a follow. 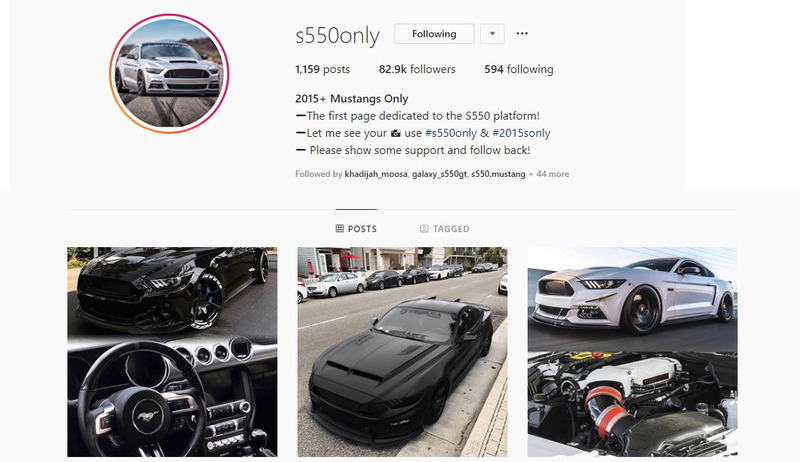 One of the newest Instagram pages on our list, S550sOnly is one of the best sources for all things S550 Mustangs. I have personally seen many new cars stripped apart and totally customized to look like a completely different car. Check them out if you are a fan of the new 6th Generation Mustang! If you are not picky on the body style and want to see many different models, following a page such as Mustang_Freakzz will give you everything that you want to see, all in one. This page has been around for years and has gained a large following for their great content and up to date Mustang news posts. They tend to update multiple times daily, so there is never a shortage of content. It is no secret that everyone loves to watch videos of Mustangs. 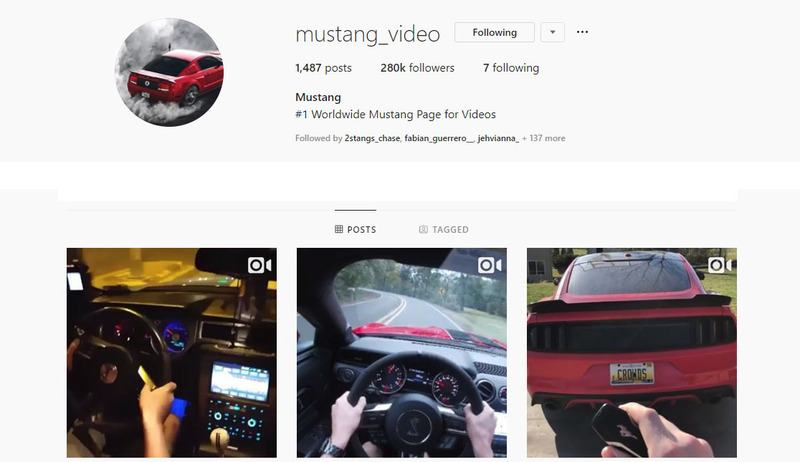 That is part of the reason the Instagram page Mustang_Video has become so popular. Posting nothing but great Mustang videos, this page offers new car features, dyno runs, track videos, and many more cool videos that are sure to keep you entertained for hours! So there you have it, 7 of the best Mustang Instagram pages to follow for daily Mustang content. As a Mustang guy at heart, seeing all of the different models and posts from these pages keeps me motivated to keep my own Mustang restored and modded to my liking. Seeing new parts from different vendors on these pages also keeps me informed of the latest parts for my car. I hope this guide has helped you pick a few new pages to follow and we hope to see your build on our page soon!